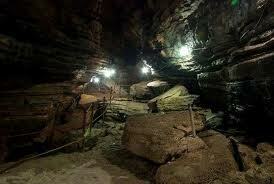 Known as BhaluDulo in the past, this ancient cave in Kusma is presently known as Gupteshwor cave. During the 1940s, few local men discovered a strange place covered by debris and grasses near the Kali Gandaki River which, when cleared, came out as an entrance to a cave. The dark cave was full of various statues and portraits of the Hindu Gods and Goddesses and a very strange sound of waterfall greeted those who entered inside the cave. Considered as one of the longest caves in Nepal, the Gupteshwor cave houses the statues of Pandava, Mahadev–Parvati, Saraswati, Nageswar and other gods and goddesses in the rocks. It is considered sacred to the Hindus and is also a popular pilgrimage site. All the statues and portraits found inside the cave are natural. The presence of the statues and portraits of various Hindu gods and goddesses adds up to its sacred and religious value. The inside of the cave mostly consists of deposition of calcium carbonate dissolve from surrounding limestone along with ground water which is found in most of the caves. Numbers of devotees throng around the cave to pay their respects and worship the Lord Shiva as the cave is considered as an abode of Lord Shiva and is locally known as Gupteshwor Mahadev Gufa. The presence of devotees is high during the festivals of Chaite Dashain and Maha Shivaratri. Not only the various Hindu gods but this cave is also a sanctuary to various species of bats living inside. The cave is located at fifteen minutes walking distance from Kusma which is about fifty five km from the city of Pokhara. It can also be reached from Baglung district as it is only seventeen km from Baglung city. Gupteshwor cave, hence, is a natural, religious as well as cultural heritage of the country and the natural statues and portraits of the gods and goddesses make the place even more attractive and amazing. Although it holds religious values to the Hindu devotees, the presence of the natural statues makes it a curious place to visit for anyone interested in the power and gifts of nature.